Every Thursday night, starting around 7 pm EST (00:00 GMT), we meet in the Mixolseum chat room and make up drinks. Usually we have a theme centered around an ingredient that we try to experiment with. The theme for November 6 was gin. Participants were asked to find a gin they haven’t previously purchased. This was a big challenge for me. I’ve made an effort to try as many premium and moderately priced gins as possible. I admit I was afraid I might have to face the dreaded lower shelves. Then I remembered Bellringer Gin. It’s a moderately priced gin, in the $10-$15 range. At first taste, this is a nice gin. It’s got a full flavor profile; It does not shy away from being a gin. It is 94.4 proof, and the high proof burn is noticeable, but not intolerable. I’ll be experimenting more with this gin in the future. Given it’s excellent price point I’m hoping it can play a role as a reliable house gin. Gin in hand, I needed to invent a drink. My eyes fell upon my bottle of Orchard Apricot. This would bring a nice sweetness. To balance, I thought of Campari, which packs a lot of punch. 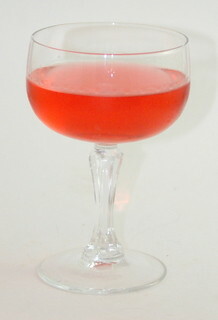 I started with 1.5 oz gin, 0.5 apricot brandy, 0.5 Campari. While there was some sweetness, there was no apricot flavor at all. I upped the apricot to 0.75 oz, which let the apricot flavor shine through without being too sweet. However, it was all a little boozy. I was going to try some sparkling wine to lengthen it, but then I remembered Lillet blanc. This quinquina helped meld the apricot and Campari flavors. At first I added only 0.75 oz, but the drink was still a little strong. At 1 ounce, the drink was well rounded. Add one dash of rhubarb bitters or orange bitters, and you have a cocktail. stir over ice until good and cold, strain into cocktail glass, relax in a comfortable chair, and sip with joy. This was one of my favorite cocktails from that TDN session! I love this and it’s something I’ll definitely make again. The flavor is surprisingly floral — the drink makes great use of the fact that Orchard Apricot is more aromatic than fruity. I used Plymouth gin and it came out very balanced, but I’ve never tried Bellringer. Googling Rhubarb bitters is what brought me to this recipe, and it’s the best use I’ve seen so far — actually, I upped the rhubarb to three dashes and slightly reduced the campari to compensate. One silly complaint: I think it’s charismatic and special enough to deserve a more distinctive name. Thanks so much for letting me know you enjoy this cocktail! I’ll definitely try upping the rhubarb bitters next time I make it!